My girlfriend's dad (Dave) is really into grilling (as are all dads). So for Christmas we figured we'd go in together to get him one of these grill attachments that he had been talking about. We looked into a Kettle Rotisserie that cost $160 and a Kettle Pizza that came in at $150 (or more). Now me being a man of limited means and boundless ambition, I decided to save a buck and build one myself. And then, I figured, while I'm at it, why not make a grill attachment that does both? After some troubleshooting and plan modifications (see below), I eventually arrived at Dave's Grill-It-All. You can see the store-bought chicken that we were using to test it. This video shows the rotisserie in action, with commentary and camerawork from my girlfriend Claire. The plans (on github) show the sheet metal parts, all made by simply cutting, bending, drilling, and bolting (no welding or fancy stuff). 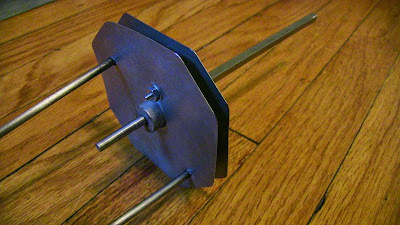 Although the pizza oven could be made with just sheet metal, the rotisserie also required a motor and skewers, which is where the real difficulty came in. The whole body and a few parts of the skewer were all constructed from two sheets of stainless steel sheet metal that I got from Home Depot for $10. 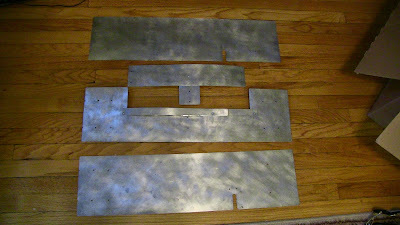 Working sheet metal is really easy if you have a big shears at your disposal (thanks UChicago!). Other fancy stuff is nice, but you can do most stuff by hand. I'll do a post someday on hacking sheet metal without the proper equipment, but if you can't wait, check out these tips and techniques. Remember that sheet metal can be razor sharp so make sure to blunt corners and sharp edges as best you can. 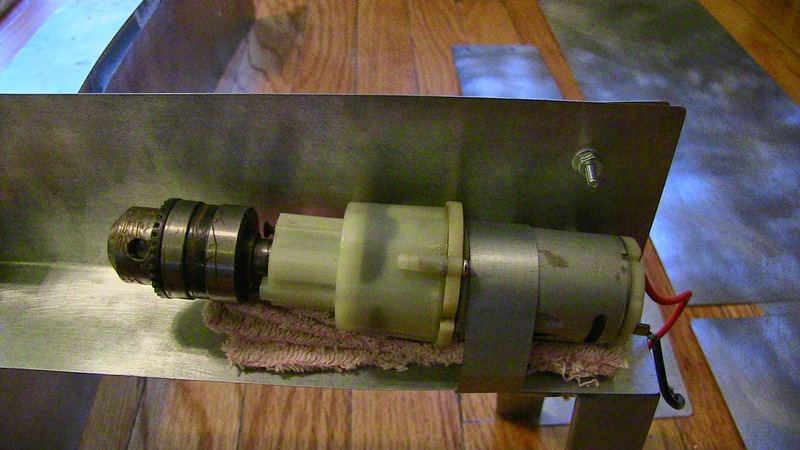 To make the rotisserie spin, I decided to use an old electric drill that had broken out of its case a few years back. I wasn't using it for anything else and I figured that would make inserting and removing the skewer easy. I hooked it up to one of my left over 12V DC power supplies with a switch. Getting the motor to stay put was a little bit of a trick because it didn't have any mounting points. I basically had to strap it in with a few left-over strips of sheet metal. I also added a layer of towel around it, to try to insulate some of the heat. 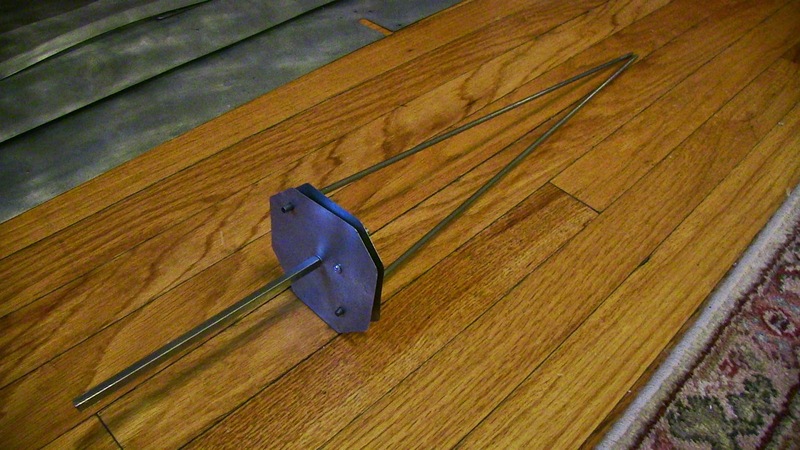 Get the skewers to attach to the grill and stay put. 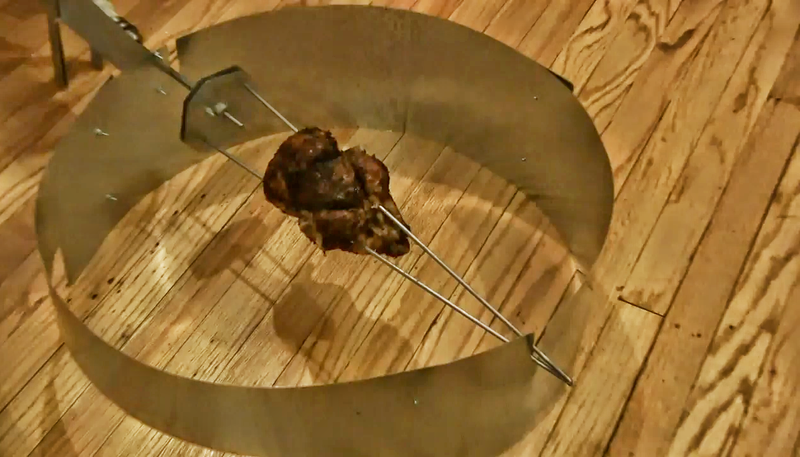 Get the skewers to hold the bird steady and rotate it. Get the skewers to connect up on the other side. Make it easy enough to get the bird on and mount the damn thing without burning the operator. Ultimately, to solve these problems, I came up with the "chopsticks" model. It basically works by skewering the bird at an inward angle from both sides so the skewers meet each other as they pass through. This secures the bird and gets the skewers to meet up on the other side. Unfortunately I still don't know how easy it is to work with compared to other rotisserie setups. 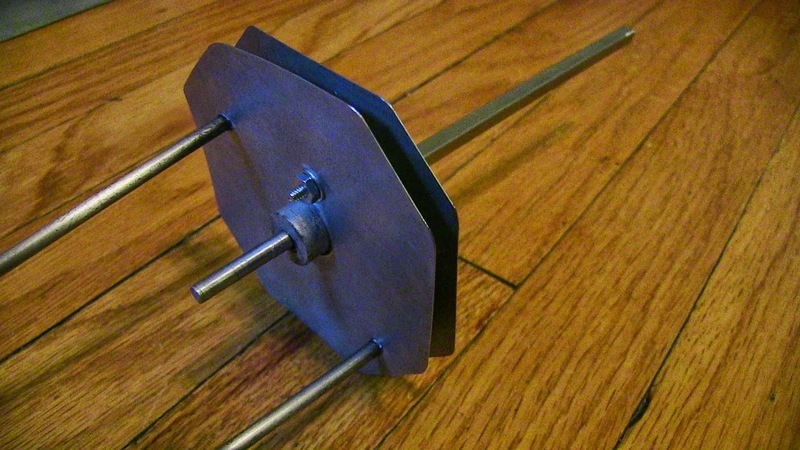 Finally, I was able to get the skewers attached by rigging up this contraption. It wound up being quite a trick to get the skewers to stay well connected to the motor. It involved rigging some odd attachments with these old gear parts from a broken sewing machine. 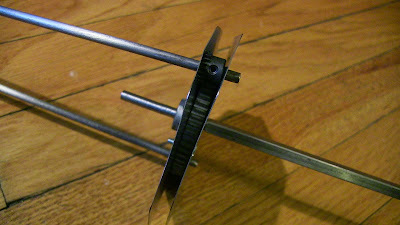 I screwed those parts on tight to the skewers and to the shaft coming out of the drill motor. Then I joined them together by screwing two plates around them on both sides. Overall, the project took about a week. Now I'll just have to wait to try it out.